I had the chance to check out a little black buffer the other day. Started to trace it, it looks like its based off jack ormans mosfet buffer. Has the same ic and 10 uf/ .1 uf cap. Cool, thanks for the info. Any picts incoming shortly? on their website there is a small pic which shows its an IC buffer. So many high value resistors!! Opamp followers are EE101 material. Hopefully, the excessive use of excessively high value resistors are being used as simple pulldowns, and one of the 0.1uF caps is being used as a power supply decoupling cap, but I suspect this is not the case. We'll never know without a trace side shot. 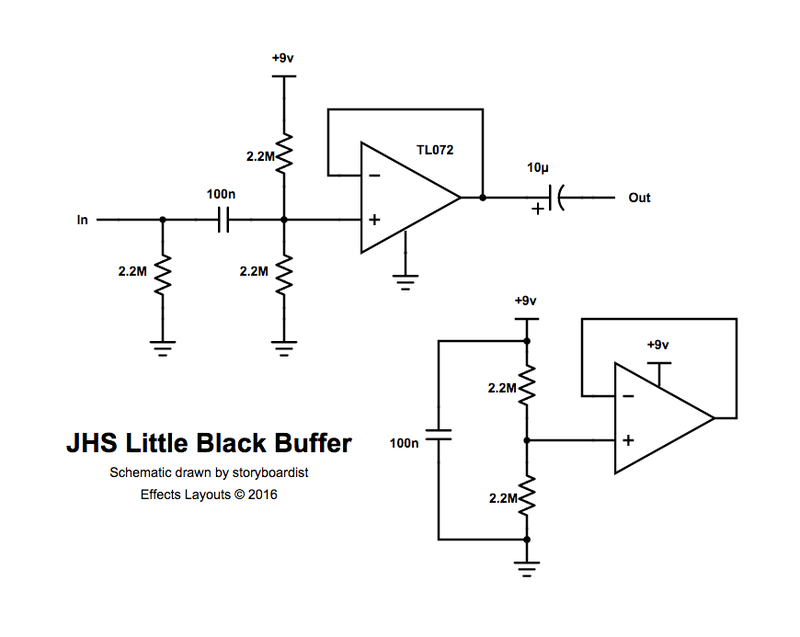 Has anyone a gut-shot of this buffer ? Is it based around a BS170 or a TL07x ?